November 18, 2010 - An Atlanta grand jury returned an indictment today against a former executive of Japan Airlines International Co. Ltd. (JAL) and two former executives of Nippon Cargo Airlines Co. Ltd. for participating in a conspiracy to fix and coordinate components of rates for air cargo shipments to and from the United States, the Department of Justice announced. 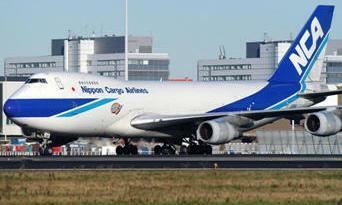 The indictment, returned in U.S. District Court in Atlanta, charges Takao Fukuchi, former president of JAL Cargo Sales, and Yoshio Kunugi and Naoshige Makino, both former senior executives for Nippon Cargo Airlines, with conspiring with others to suppress and eliminate competition. By fixing and coordinating certain components of cargo rates charged to customers for international air shipments to and from the United States. Fukuchi and Kunugi are charged with entering into and participating in the conspiracy from at least as early as December 1999 until at least February 2006. Makino is charged with joining and participating in the conspiracy from at least as early as June 2001 until at least February 2006. According to the indictment, Fukuchi, Kunugi, Makino, and co-conspirators participated in meetings, conversations, and communications to discuss and fix certain components of cargo rates and coordinated the timing of changes to those rates. As part of the conspiracy, Fukuchi, Kunugi, Makino, and co-conspirators implemented collusive cargo rates in accordance with the agreements reached, and accepted payments for shipments at collusive and noncompetitive rates. Fukuchi, Kunugi, and Makino are charged with price fixing in violation of the Sherman Act, which carries a maximum penalty for each individual of 10 years in prison and a $1 million criminal fine. The maximum fine may be increased to twice the gain derived from the crime or twice the loss suffered by the victims of the crime, if either of those amounts is greater than the statutory maximum fine. A total of 19 airlines and 17 executives, including Fukuchi, Kunugi, and Makino, have been charged in the Justice Department?s ongoing investigation into price fixing in the air transportation industry. To date, more than $1.7 billion in criminal fines have been imposed and four executives have been sentenced to serve prison time. Charges are pending against 13 executives, including Fukuchi, Kunugi, and Makino. Today?s charge is the result of a joint investigation into the air transportation industry being conducted by the Antitrust Division?s National Criminal Enforcement Section and Atlanta Field Office, the FBI?s field offices in Washington and Atlanta, the Department of Transportation?s Office of Inspector General, and the U.S. Postal Service?s Office of Inspector General.